After I finished watching the series Grimm (marathon of the last 3.5 seasons) for the past few weeks, I was thinking of completing other series that have ended, but then I thought why not I see something else that was not too long before I do that. So this series fit into that category which only had 10 episodes in the first season. I was able to finish this in few days only and just completed it last night. Now I can share my views of this series. 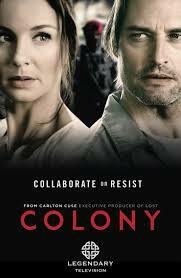 Series started with the introduction of Will (Josh Holloway - Mission Impossible: Ghost Protocol and Lost TV series) and his wife Katie (Sarah Wayne Callies - Prison Break and The Walking Dead TV series) with their children, a high school student named Bram (Alex Neustaedter) and his younger sister Gracie (Isabella Cramp). They were all living in Los Angeles at the time where earth had been invaded by some aliens (this event was referred to as "the arrival"). The city was now circled by a huge wall where nobody can go out of the city without proper identification from the authority which was called Colony Transitional Authority. Will apparently had idea of his own to escape outside the wall. It would be revealed later the reason for his intention. Meanwhile Katie was having some other activities, like trying to acquire insulin for the son of her sister Maddie (Amanda Righetti - Friday the 13th 2009 version, The Mentalist TV series). Katie was also having some kind of odd relationship with a mysterious person named Eric Broussard (Tory Kittles - American Heist). The city of LA was considered as a bloc where it was led by a proxy governor named Alan Snyder (Peter Jacobson - House TV series). He was appointed by the aliens to lead LA due to his past experience handling multi billion dollar companies. Proxy Snyder and other richer people were living in a high end location called Green Zone protected by the army referred as Redhats. They were all called the Collaborators. Redhats were in control of the whole city to ensure the place was in order and avoid the annihilation of human by the aliens. If anybody was captured doing something illegal, they would be sent to a place called The Factory (some place supposedly very far away and never to come back to their family). The general population though, were very much against the Collaborators and a small group joined themselves while trying to fight against them. They were referred to as the Resistance. The story would be concentrating on Will and Katie's struggle to survive as best as they could with such condition and mainly on the fight between The Resistance and The Collaborators supported by Redhats, with some mysteries revolving around the arrival and the aliens. Well this series apparently was very unique. The pilot episode's first 1/3 was a bit unclear what the series would be all about. But then it picked up very fast and suddenly I was hooked, especially at the end of the episode which gave me a shock. My suggestion if you want to watch this series, you got to resist the temptation to stop watching its pilot after few minutes and continue till the end. In the second and subsequent episodes, you would be given a lot of amazing plot filled with double crossing, backstabbing combined with some actions. The subplots though were not really that intriguing and in fact a bit more like a distraction. Though 1 or 2 plots were better than the rest, but the main plot was the exciting one. Another uniqueness of the series was that it was told in the time after "the arrival" but there was no scene showing it at all. We were only shown glimpses of the damaged buildings appeared to be due to their attack. One of the intriguing factor was also whether or not we could see the aliens or this attack. So this series probably cannot be categorized as alien series like The Falling Skies (with Noah Wylie as the main character), since the aliens only served as a background. The special effects of the series were not that spectacular. We could see some of them were computerized, but those were not really the main attraction anyway. The action sequence were quite good with the best ones I think in episode 5 and 6. There were some intense moments, and the season finale gave us a some cliffhanger to look forward to season 2 as well. By the way there were few brief moments of love making in the series but not up to the vulgar level of Game of Thrones. The characters development (if you are looking for these kind of things) were quite good, especially on Will and Katie. Even a surprising thing related to Maddie's character. The series also have plenty of noteworthy guest stars such as Paul Guilfoyle (CSI TV series) as Quayle a Resistance cell leader, Carl Weathers (Rocky movies) as Beau a Homeland Security officer, Adrian Pasdar (Nathan Petrelli in Heroes TV series) and Kathy Baker (The Age of Adaline, Picket Fences TV series). So there were plenty of additional characters in the series to make it more interesting. Finally if you are a fan of science fiction, drama, mystery series then you would enjoy this series. However, if you are a major fan of alien story of alien vs men, I guess you might not be able to enjoy this series as it did not provide those scenes (at least in season 1, since I have not seen season 2 which may or may not have them). But if you are looking for a unique story with aliens in the background, then I would recommend you to try and watch this one. It's available via online streaming.